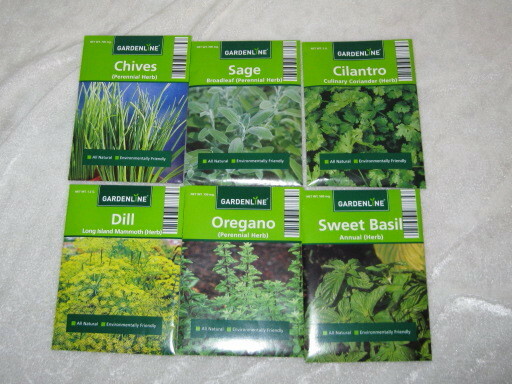 I always plant tomatoes and cucumbers, plus sugar snap peas, zucchini, radishes, and lettuce varieties. I already have raspberries and strawberries that should come back up. And I love planting new herbs! Oh... and lots of flowers!!! Planting basil and all kinds of herbs and peppers. We rent a house, so can only do so much! Not currently planning to plant anything. Though I will if I happen to win these. I help out with the local community garden. We have to do a container garden because my landlord is a putz that won't allow a regular garden so I am limited in my choices (no watermelon...boo) but I do plan to grow tomatoes, herbs, bell peppers and some flowers. Green peppers, tomatoes, strawberries, broccoli, and beans. This will be the third year I have a garden in my backyard. Each year it gets bigger. In addition to tomatoes, squash and beans, I will add raspberries, cucumber and broccoli. Tomatoes, potatoes, green beans, corn, zucchini, yellow squash, butternut squash, acorn squash, okra, lettuce, leeks, green onions, chard, kale, herbs, flowers, grapes, fruit trees, berries, and I'm adding roses this year! We are having a problem finding enough sun at the new house we are moving to, but are determined to at least have cukes, tomatoes, and peppers. Herbs, tomatoes, potatoes, onions, corn...lots of good stuff! Tomatoes, Cucumbers, Green beans, Peas, Peppers, Herbs, Flowers. Hoping to be doing lots of canning and freezing to cut down on our grocery bill. Tomatoes, peppers and carrots for sure. I'll probably throw a few last minute things in there too! Assuming I can get my soil to a ph level that will produce vegetables on the plants, I hope to plant several kinds of tomatoes, peppers, beans, peas, potatoes, squash, onions, and whatever else I can get my hands on. The Snow Peas are already planted, tomatoes, cucumbers, zucchine, lots of herbs. I'd love to try herbs! Tomatoes, cucumbers, peppers, lettuce, radishes, zucchini and hopefully some herbs!! I will be planting zucchini, tomatoes (Big Boy and Roma), cantaloupe, cucumbers, yellow and green string beans, pumpkins, Blue Hubbard squash, yellow summer squash, bell peppers, and jalapeno peppers. Peppers, tomatoes, onions, and flowers! I'd love to try herbs...also planning on lettuce and tomatoes.